How can we delete invalid partner entries from SAP Global Trade Services (GTS)? Normally this type of errors occur during the transfer of the Business Partner when there is an inconsistency in the BP master data. 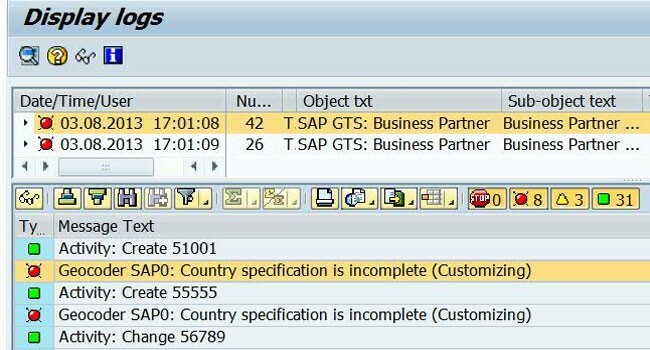 Where there is an entry in the GTS table /SAPSLL/PNTBP for the partner(s) but no corresponding entry in the BUT000 table. GTS uses a mapping table /SAPSLL/PNTBP, to map the number of the Business Partner from the feeder system to the internal number. For every Business Partner created in GTS there is an entry added to this table. If such inconsistent entries exist when the partner is transferred to SAP GTS during the initial transfer (first time) then SAP GTS incorrectly recognizes the partner as already existing in the system. The deletion of the incorrect data from the mapping table will allow correct transfer of the Business Partner to SAP GTS. To maintain consistency all data related to such Business Partners present in any customizing table, audit trail, document or customs worklist must be deleted before successful transfer can happen. From GTS 7.1 onwards, standard program /SAPSLL/BP_DATA_CLEANUP can be run in transaction SE38 to delete the inconsistent entries. The program can be run first in simulation mode by checking the simulation flag on selection screen. This will identify in advance the functionality of program before it is ran in live mode. Any dependent database table entries identified in the report, have to be archived before the report can delete the entries. Generally it is not recommend that Business Partners are deleted directly in GTS, but rather marked for deletion in feeder system, so the deletion flag is taken over to GTS on transfer. An exception to this, is when there is corrupt/inconsistent data and a direct deletion is necessary via the report mentioned above.